Then I read the one other book that is between me and being caught up. Downside: Ascension is the next to last book in that Fate of the Jedi series I’ve been reading, and I started the final book since, which means the story bleeds together a little. Plus also, nevermind 43 years of in-universe spoilers, it’s also reaching the point where it’s hard to mention anything and not hit big-time in-series spoilers too. Once again, not a ton to say about this one, long story short. A thing that is noteworthy, though, is the tone of the series. It’s never been exactly grimdark; I mean, it’s Star Wars, for crying out loud! 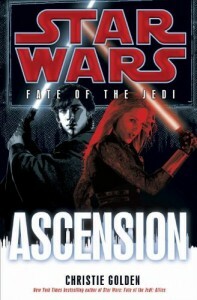 But the first two thirds of the series were all very serious, with an Imperial ex-admiral as chief of state for the current governing body (Galactic Alliance), and the Jedi in disgrace, and all the slavery talk I’ve mentioned previously, and a new incursion of a planetful of Sith, and a weird dark god trying to take over everything. Not that the final third hasn’t been like that, but there was a note of hopefulness throughout that has been firmly quashed. Not to the extent that I have any serious concern for the wellbeing of the galaxy or really even of any of the main characters (well, maybe a little bit), but to the extent that it doesn’t really feel like a Star Wars movie. Upshot: I’m still glad this timeline is due to collapse in a month and a half. This entry was posted in Words and tagged fantasy, Fate of the Jedi, Star Wars on October 29, 2015 by Chris. So, uh, it’s been a while, right? I was in the middle of a move, and early in that process (so, like, late September / early October) I read two books. Since then, I’ve slowed way down on my reading, with no time for movies in ages, and I haven’t even unpacked a game system yet, which means I’m not as far behind as you’d think, even though I am massively out of date. 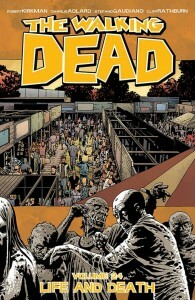 That said, I’m not sure you’d have gotten much a review of the latest Walking Dead out of me regardless. Because Life and Death proves what I’ve been saying for more than a year now: this series is over, it’s just continuing to shamble forward like an implausibly on-the-nose simile of some kind. Something something new high stakes enemy that is the same as all the previous high stakes enemies that I used to care about? Blah blah Carl is still cool, and I’ll keep reading, but man. This should have ended after All Out War, period. A thing that’s more interesting to me is why I forgive this kind of behavior from superhero comics. There’s no reason why The Walking Dead can’t be an open-ended series in which new threats continue to emerge, challenge our heroes, and fade away. Contrariwise, there’s no reason why it shouldn’t bother me that superhero comics follow this exact same formula, only on a more repetitive track. I started to say that, well, tWD is more realistic, and that’s why it bothers me, because realistic stories are more obliged to have conclusions. But, um, worldwide zombie apocalypse does not actually fall under the realism category. It might seem like I’m that far gone, but I’m not. (Or maybe I am, and that’s the answer? Disappointing, if so.) I guess I could be trained by expectations for superhero stories to last forever, so they get a free pass because it’s always been that way. Or maybe I’ve been trained by other graphic novels I’ve read over the past ten years that do have endings, and would not have cared if this was yet another in a series of ongoing plots. 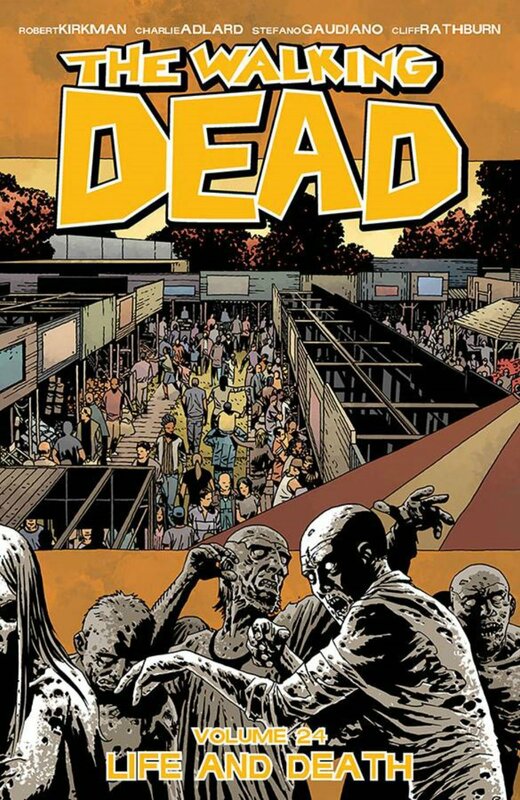 Whatever the case, Kirkman definitely missed his chance for a graceful exit, and while I’m not exactly hate reading these yet, it’s definitely hard to recommend them as any good. They’re, you know, fine? I’m just not sure I care that much anymore, and that’s sad when you consider how good it used to be. Last minute new theory that I should test with future books: maybe I get bored with post-apocalypse once it doesn’t feel like an apocalypse anymore. There’s just a substantial difference between people on the run from undead and human menaces at every turn, and people who are plotting a war with a large-scale enemy while also holding a giant weekend trade days flea market. This entry was posted in Words and tagged graphic novel, horror on October 27, 2015 by Chris.